Shopping? Start getting this specific nutrition into your body ASAP. You can shop locally for whatever you need, or shop from the source I use and save some money. Purchase The Tendon Pack and save $33 overall. Total cost after S&H, tax, etc is $76. The Tendon Pack is the four products in the picture to the left. It covers the basics that I described, that you MUST put into your body if you want to help make sure your body has what it needs to outperform the Pain Causing Dynamic and Carpal Tunnel ‘syndrome’. Total cost after S&H etc is $171, and overall you save about $90 (protein powder isn’t cheap, and the Vit C is high quality and specifically buffered etc). I do love the discount I get! Like I said earlier, you can shop locally or through me. I get a good discount and pass it along to you. The supplements in The Tendon Pack are a necessity. The extras in The Tendon Repair Pack are specifically if you definitely have tendon/connective tissue damage of any kind (wear and tear damage, tendonosis, small tear, post-surgery damage and desire to heal). But even if you don’t have actual damage, the body loves nutrition. The above are two ready-made nutrition packs. 4) The very first page of products that you come to will be my 7 suggested products, the 'Tendon Pack'. 6) If desired, browser Emerson's website for other products. You can search by brand, or ingredient, etc. 7) Then check out and purchase, etc. The 'Tendon Pack' consists of Magnesium Glycinate, Liquid Vitamin D3 (2,000i.u. 's per drop), Vitamin B6, and Vitamin B12 methylcobalamin. Those are the Big Four for everyone. Also suggested is ransdermal Magnesium Gel to apply topically is an option, as are any of the best protein powder's I've used (the cacao chocolate flavor ain't bad! ), and one of the best options for Vitamin C.
Definitely check the 'Vitality C' Vitamin C if you want the benefits of Vitamin C.
If you have Levaquin Tendonitis, then there's glutathione, CoQ10, etc. The following four products are suggested in the ebooks. The products in the Tendon Pack are what I purchase for personal use. Magnesium Glycinate and Magnesium Malate. Glycinate is put together such that one can take approximately 1/3rd more than other kinds before coming close to tolerance level. Rx Vitamins brand liquid Vitamin D3. Tastes like olive oil, comes in 2,000 i.u. 's per drop which works out to about 75,000i.u. 's per dropperful. This is great for people like me that take a month's worth of Vitamin D once a month instead of daily. Even if on a daily or weekly basis, I like the drops better than the equivalent in pills. Vitamin B6. B6 is B6, brand doesn't really matter, so I put one of the cheaper options they listed in there. Vitamin B12 methylcobalamin. Your B12 MUST be Methylcobalamin instead of Cyanocobalamin (which is mostly what you'll find out there). Methylcobalamin is research proven to be FAR more effective than Cyanocobalamin. If you use my suggested products as examples of what to buy locally, great. If you purchase them online with Emerson, I would appreciate that, and you'll likely save some money as well. Return to the top of this Purchase Tendonitis Supplements page. 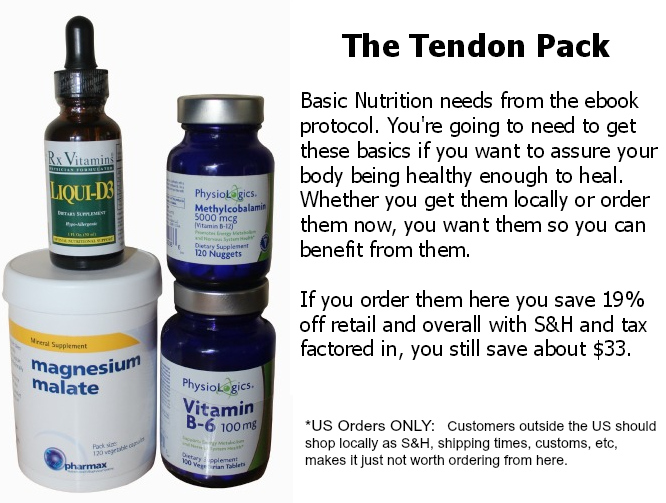 Go to the Tendon Supplements page.